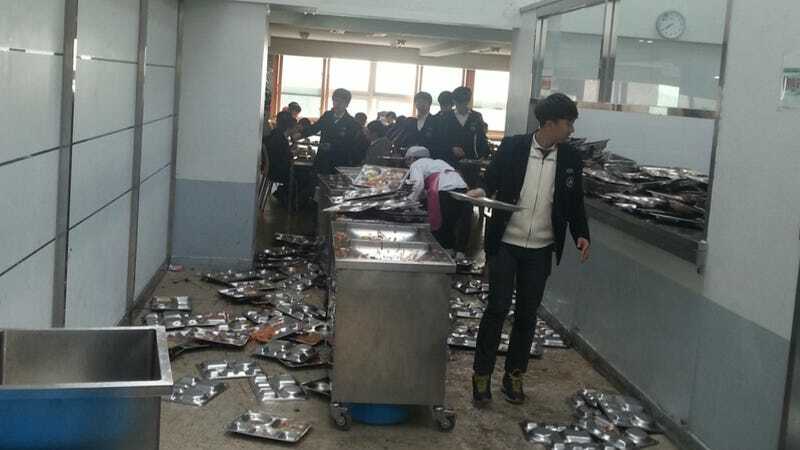 According to online reports, this is apparently a high school lunchroom in Seoul. A disaster of a lunchroom, that is. The images were originally uploaded in South Korea with the title "The Worst High School" and have become a hot topic online, reports Rakuten Infoseek. The photos went viral in South Korea, racking up over 90,000 likes on Facebook. After these students ate, they seem to have dropped their dirty trays in the lunch lady's general direction, instead of putting them away. Online in South Korea, people saying that this is "truly awful". Other feel bad for the lunch lady, and some think that the tray return system needs a severe overhaul. Others wrote things like, "These students have zero morals." As it is with these kind of things, the images themselves do not appear to tell the whole story. Because the photos became such a big deal, the school's vice principal actually had to comment on the matter, explaining that the cafeteria staff was shorthanded (there was apparently a worker's strike), and that all the stacked dirty trays were accidentally knocked over. "Please don't make excuses," wrote one individual online in South Korea. "This is a trashy school." In neighboring Japan, people online are uploading photos of how tidy Japanese children are at lunch and are, thus, using this as a way to criticize South Korea. "What is this a zoo?" asked one. The criticism at Korea is totally not fair; Japanese kids can be slovenly, too, and this is certainly not the norm in South Korea. People there are just as shocked as anyone by these images, whether they were intentional or accidental. This is a mess!